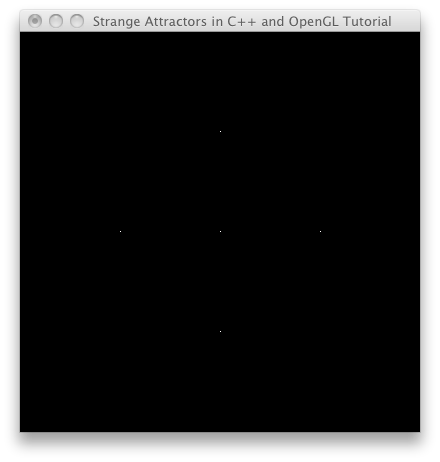 On this page I will show you how to get started rendering strange attractors using C++, OpenGL, and GLUT. The information will be laid out in tutorial form, but you can always skip to the end and get the code. I’m going to assume a basic level of understanding of programming, math, and graphics, focusing on getting you up and running with this specific application of creating chaotic attractors. If I cover something that’s rudimentary to you, just bear with me, and if I skim over something that’s confusing to you, just leave a comment and let me know! 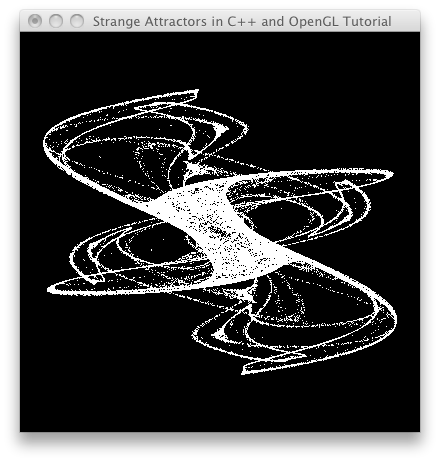 By the way, if you just want to generate strange attractors without programming, there’s a great (and free!) program called Chaoscope that you should take a look at. C++: We’ll be using this language because it’s the one I know. But really, we’re just using C functionality in this tutorial, as this introduction to the topic doesn’t justify creating classes or anything else fancy. Global variables and procedural programming will get us generating images more quickly! OpenGL: We need something besides C++ to show graphics on the screen. OpenGL is great because it’s easy to get (probably already installed), free, and cross-platform (Mac, Windows, Linux, etc). GLUT: We’ll need a way to initialize a window on the screen to drawing into. I hate dealing with platform specific windowing code, so I use GLUT, which is admittedly old, but is cross-platform and will serve our purposes well for this application. Strange Attractors: If you’re on this page, I’m assuming you know what a strange attractor is or have at least seen one before. They are fascinating mathematical objects, they are easy to program, and I have used them to create artwork since 2001. I was first introduced to strange attractors in Clifford Pickover’s Chaos in Wonderland. Therefore, we’ll be recreating The King’s Dream, one of the Pickover attractors from this book. Platform: I’m going to leave out platform specific setup procedures. This means I’m assuming you have OpenGL and GLUT installed and configured to work with your coding environment and know how to at least compile a “Hello World” type console application or command line tool linked to these libraries. I happen to be using XCode on OS X, so if you need help with XCode specifically, leave a comment. Math: When rendering a strange attractor, you are basically visualizing the phase space of a chaotic dynamical system. Many chaotic attractors, such as the Lorenz Attractor, are defined as a set of differential equations. In order to solve and simplify differential equations for programming, you generally have to numerically approximate the system using something like Euler’s method or the Runge-Kutta methods, though we get to skip that step because the Pickover attractor is, in a way, already solved for us. We will be using a set of simple iterated functions that gives us an point for every iteration. It’s always good to start simple. There’s always a bit of headache getting these things going as the linker may complain about undefined symbols, we may forget a header file, etc. So let’s just do the minimal OpenGL and GLUT setup, giving ourselves a keyboard callback function so we can hit ‘Esc’ to exit the program, setting up a 400px x 400px window, and clearing it to black. Make sure your code compiles and runs, giving you a black screen 400 x 400 pixels, and exiting when you hit the Esc key. Now we’ll set up an OpenGL viewport to fill the whole screen, and we’ll manipulate the projection matrix (think of this as camera settings) with the gluOrtho2D function so that the origin (0, 0) is at the center of the screen and the coordinates go from -2.0 to 2.0 in both the x and y axes. a = -0.966918,			// coefficients for "The King's Dream"
a = -0.966918,	// coefficients for "The King's Dream"
As you can see, the actual strange attractor equations are quite simple. The new point is calculated with two functions, one for x and one for y. Each function contains some trig functions, the variables x and y, and some coefficients (a, b, c, and d, which don’t change). You can think of this like a little machine: insert an x and y value (a point in space), and get a new x and y value. We have to use separate variables for the new x and y since each is dependent on both the previous values of x and y.
Congrats! You have rendered a strange attractor. But… it’s not that beautiful. Let’s make some adjustments to improve the quality. First, we’ll change the alpha value of our foreground color, which will allow each pixel to build up the image in layers. We’ll have to turn on blending in OpenGL for this to work. Second, we’ll enable point smoothing in OpenGL to get smoother, antialiased lines. Also, we’ll increase the number of iterations from 100,000 to 1 million. who says the coefficients have to stay the same for a million iterations? try randomizing or interpolating them. Explore my strange attractor artwork. Was this helpful? Do you have any questions? Please leave a comment below and let me know. Thanks! Just what I was looking for. Now I am off to color it with some hsv magic. You’re welcome! Come back and let us know how your coloring went. But I’ve got a question- can you prepare a new one, with third dimmension, and a bit of colouring? Or just give me, let me name them- key words- functions or techniques, which can help me write such a program. I’m glad you found it useful. For a three dimensional strange attractor, you’ll need to use gluPerspective instead of gluOrtho2D, and you’ll want to find (or make up) a set of equations that creates a 3d attractor (one equation for each of x, y and z). One example I found with a quick search is here: 3d strange attractors. For the coloring, try playing with the values in glColor4f (foreground) and glClearColor (background). You can also play with different blending modes. More complex coloring requires gradient mapping, or other techniques to determine the color of a point (e.g. Paul Bourke’s technique for coloring attractors). Maybe I’ll create some tutorials for these in the future! First off – thanks for the guide. In this case the program doesnt seem to plot all the points. At high iterations the points near the starting point seem to go missing. I have no clue as to why this is. Hope you can help me. Hi Martin, glad you found the guide helpful. I might be able to help if you post some more code… it’s hard for me to know what you’re trying to do with just that snippet. Specifically, where does dt come from? In general with the equations I’ve experimented with, as the iterations increase, the attractor fills out more and more.